Suggested Citation: Ernstorfer, Anita, Isabella Jean, and Peter Woodrow, with Diana Chigas. 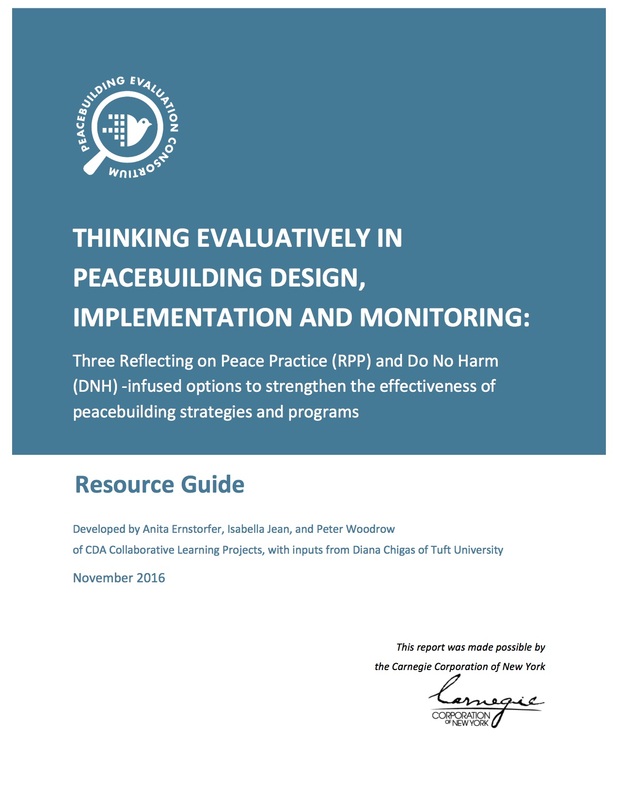 Thinking Evaluatively in Peacebuilding Design, Implementation and Monitoring: Three Reflecting on Peace Practice (RPP) and Do No Harm (DNH)-infused options to strengthen the effectiveness of peacebuilding strategies and programs. Peacebuilding Evaluation Consortium, 2016. This resource has been developed by CDA Collaborative Learning Projects in partnership with the Peacebuilding Evaluation Consortium (PEC) and with funding from the Carnegie Corporation of New York. Particular thanks go to Cynthia Clapp Wincek (Alliance for Peacebuilding), Leslie Wingender (Mercy Corps), Mark M. Rogers (independent consultant), and Kiely Barnard-Webster (CDA Collaborative Learning Projects) for their review, and helpful suggestions. CDA works with a variety of partners to develop and apply tools and processes for monitoring and evaluating conflict sensitivity and peacebuilding initiatives. We facilitate program quality and evaluability assessments, feedback mechanisms, the development of monitoring and evaluation frameworks, as well as the design of meta-evaluations. 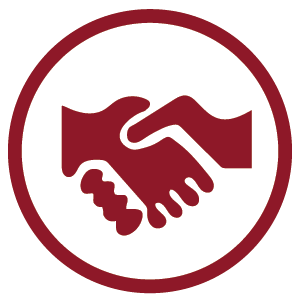 Our donors and partners support CDA because we combine rigorous analysis with pragmatic field-level work and deliver practical tools to field staff and policymakers alike. We help peace practitioners, and organizations improve the relevance and accountability of programming through better tools for conflict analysis, program strategy, design, and monitoring and evaluation. CDA has also contributed to influential policy guidance, such as the OECD/DAC guidance on evaluating conflict prevention and peacebuilding activities. Our services, guidance, and tools are grounded in field experience, enable organizations to learn with and from each other, are oriented towards practical application, are broadly relevant across many contexts, and are uniquely adaptable. You may contact Anita Ernstorfer, Director of Advisory Services, at aernstorfer@cdacollaborative.org for more information. The Peacebuilding Evaluation Consortium (PEC) is a project of Alliance for Peacebuilding (AfP) in partnership with CDA Collaborative Learning Projects, Mercy Corps and Search for Common Ground (SFCG). The project is funded by the Carnegie Corporation of New York (CCNY) and is field-wide effort to address the unique challenges to measuring and learning from peacebuilding programs. Fostering the Use of Evidence to Inform Peacebuilding Policy.